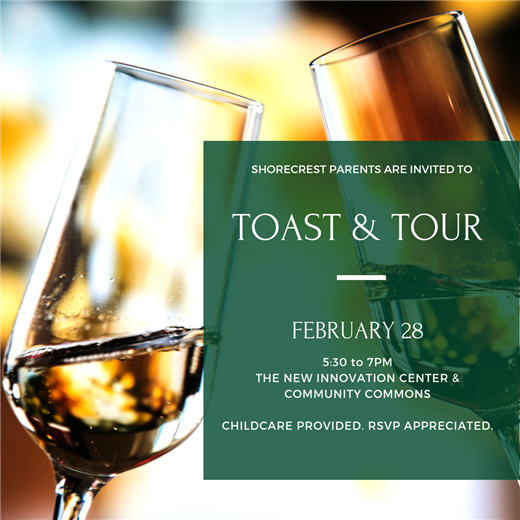 On Thursday, February 28, Shorecrest will host two events in celebration of the nearing completion of the first floor of the new Innovation Center and Community Commons. If you will be joining us for either the morning Milestone Celebration or evening Toast and Tour, please see details below. We look forward to seeing you all next week! All Shorecrest parents/guardians and Faculty/Staff are invited from 5:30 - 7pm to toast the wonderful progress of the new Innovation Center and Community Commons. Tour the facility at your leisure and the celebrate the opening of the first floor! There are several community events taking place on campus that night, so for your convenience parking will be available in front of the Lower School. You may also want to consider carpooling or using a rideshare service like Uber or Lyft. If you registered for childcare that evening, please check your children in at the Rec Gym prior to joining us at the new building. We are so excited for you all to see the tremendous progress in anticipation of our March 18 opening!